hello so I just replaced the clutch plates in my 2007 trx250x got it all back together and now I can't get this cable to hook back up correctly, I can't find anything specific on it so if anyone has any advice it would be greatly appreciated. That cable looks slightly damaged, but can be bent back into straight with pliers and patience. 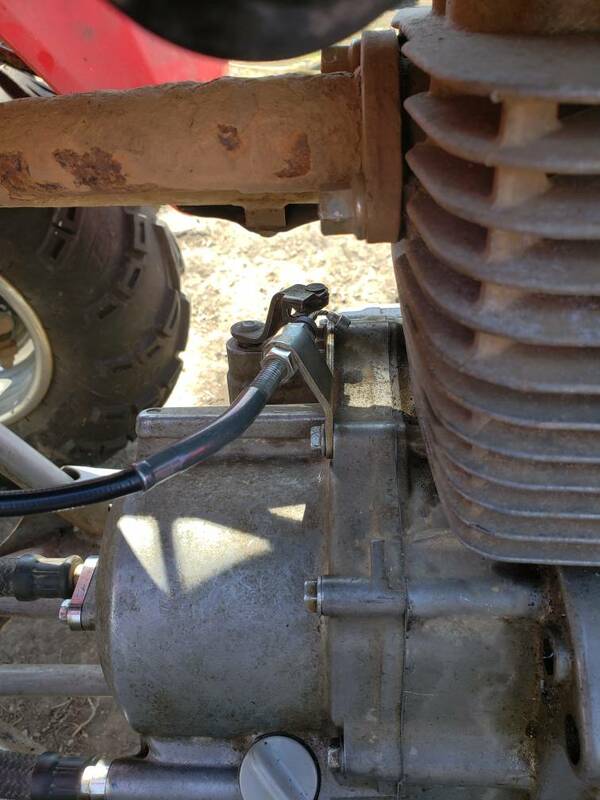 First of all, there was probably no need to unhook the cable during clutch service, however all you have to do is to run the nut on the side away from the operator end all the way to the end of the threads. That should give you enough slack to put the cable end in the holder, then pull the cable sleeve away from the bracket and run the nut up to the holder. When you have the lever adjusted the way you want it, run the second nut against the cable holder and snug it up ti lock the cable in place. I replaced the cable and clutch lever (had a lot of play) got it pretty tight with adjustment and theres no clutch engagement at all, even before I replaced it there just slipping horribly. That's the the I just replaced the clutch but it doesn't engage at all now clutch lever doesn't spring back like it's supposed to it's just loose. I'm going to bet you have either assembled the manual clutch incorrectly, or the problem is actually in the centrifugal clutch. There is no clutch adjustment - all you can do is adjust the free play on the clutch lever using the nuts and threaded portion of the cable next to the release arm and the handlebar adjuster at the lever. If it won't drive with the clutch cable disconnected - and there is no problem in the transmission or drive line, then you are going to have to take the front cover off the engine and inspect the parts to find what the problem is. These are not simple machines - there are lots of pieces and they have to be assembled in the correct manner to work right. Last edited by Here 2 help; 05-07-2018 at 08:36 PM.